I sometime draw with a tablet terminal and its pencil. It is really convenient. 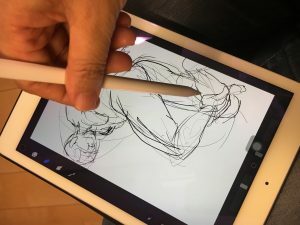 If you want to decide the way of drawing on-the-spot like in front of a model, you need to bring all tools you use, a pen, a pencil, a pastel, a ball-point pen…if you use tablet terminals and its pencil, all you need to be careful is not to forget to charge the battery. However, I just have a little complaint. Those are too smooth when I draw. Those do not convey rough surface feeling agains paper so my brain slightly misunderstand I really draw something or not. On the other hand, my brain does not confirm ” I surely did” because it does not feel paper resistance. The feels of touching paper makes contrasts of lines so it is very important. If the maker create the feeling of touching, I do not know I keep using paper and pencils. 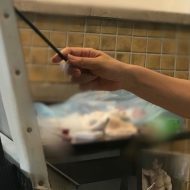 © 2019 アタリサオリ Official Site. All rights reserved.